Akit's Complaint Department: Can Muni Simplify the Proof of Payment Policies? I've mentioned in a recent blog entry about needing some clarification about Muni's "Proof of Payment" policy. I stated my interpretation of the expired transfer policies are different between POP (metro) and non-POP lines (buses and F-Market). For metro lines, an expired transfer during the journey is bad because of the risk of a $75 ticket, but for buses, the policy is different as an expired transfer during the journey is OK, just as long as the passenger entered the vehicle when the transfer didn't expire. It made me think about the POP policies posted on the SFMTA website. It's just way too complicated. The word "Proof of Payment" is defined in more than one way, and that confuses the hell out of me. When it is defined as a receipt or pass for when riding all vehicles and paid platforms, it's quite simple. But when using it to also define "POP lines" and "non-POP" lines with different sets of rules (e.g. expired transfer policy), it messes things up. It also complicates the problem with Clipper cards. Since passengers who pay with e-cash don't get a paper transfer that tells them when it expires, some may not keep track of what time they first tagged their card, and if their card is still valid within the 90 minute window. When a person tags their card between minute one and minute 89 of their valid transfer for entry to a metro vehicle, their entry is valid, but most won't keep track of their transfer validity. How is this handled when encountering a fare inspector? I propose simplifying the Proof of Payment system to make it easier for everyone. The standard rules of fare evasion still applies. No proof of payment and boarding through the rear doors of buses regardless of valid proof of payment in constitutes a violation. Proof of Payment is required for all Muni lines. To obtain proof of payment, pay at a faregate, a farebox on vehicles, or for metro vehicles, the operator's cab on the first car. Clipper automatically retains proof of payment electronically when successfully tagged on a card reader. For paper transfers, riding any vehicle requires the transfer to not be expired. If expired, obtain a new transfer from the operator. For Clipper e-transfers paid with e-cash, entry into the vehicle for the first tag gives 90 minutes of validity, however, if the passenger enters a vehicle with less than 30 minutes left on the transfer, the passenger has 30 minutes to complete their stage of the journey without being fined (e.g. passenger enters w/e-transfer with 15 minutes left, but can ride until 15 minutes after e-transfer expires). That was easy, just five rules. There's no fork in the road that separates the "POP lines" versus the "non-POP lines," and differing expiring transfer policies. Either you have proof or not. Muni can still speed-up their bus service if they allow all-door boarding. Yep... in their [unionized] dreams. 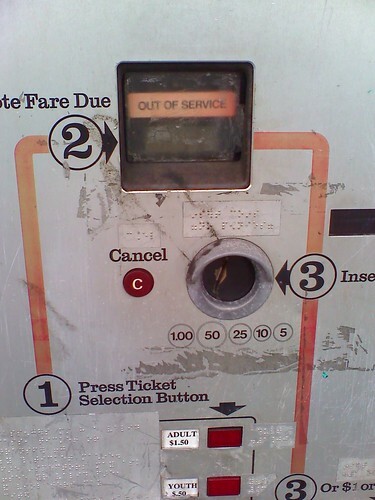 I think that the fare inspector system costs way too much and has many negative benefits. Now, they are doing away with paper fast passes! Why dump on the union? The mamagement is overpaid and sluggish to respond!